Rudolph is still waiting on his Christmas miracle. Right down to the wire. 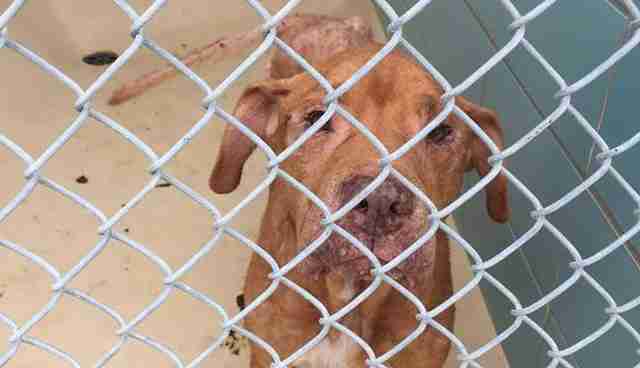 He's on death row at the Hillsborough County animal shelter in Tampa, Florida, and can be euthanized at any time - though, you wouldn't know it by looking at this 10-year old boxer. In a Facebook post, animal welfare group Rescue Me Tampa Shelter Dogs says his tail won't stop wagging. His "crime"? He's been without a home too long. Rudolph suffers from a litany of medical conditions - dermatitis, dry eye, dental issues. He also has heartworm and a small growth on his back. This is a dog forsaken, abandoned and swallowed by the shelter system. Except, somehow in the absence of any obvious love in his life, he still radiates it. As brightly as the ruby red nose of his holiday namesake. "If this guy could talk, he would tell you he is so worth saving," reads the Facebook post. "He was one of the happiest dogs in the shelter." Beneath all those health issues, there's an angel dog dying to get out. Despite the burden of bearing so many health issues, there's a perfect prescription for Rudolph. It begins with a foster home. If you would like to be Rudolph's Christmas miracle, send an email, soon, to rescuepets@hillsboroughcounty.org and CC to rescuemetampa@yahoo.com.